This pose lengthens your lumbar spine (that’s the spine through your waist). The traction from your back leg reaches through your hip and into your spine through your waist area. The front of your thigh and hip crease are lengthened. For this reason, in Svaroopa(R) yoga we don’t go into a deep forward bend directly after this pose as some other styles of yoga may do. 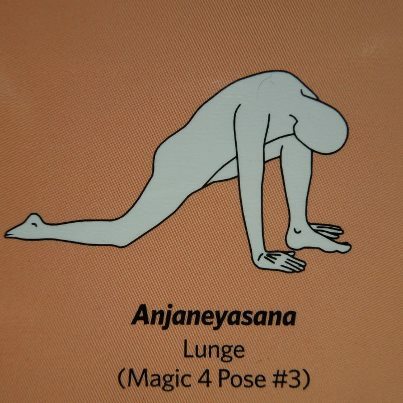 Lunge also qualifies as a very gentle backbend for your lower spine. The weight of your head as you lean your head forward (which can weigh as much as a small bowling ball), creates a traction which lengthens through the back of your neck and upper spine, decompressing your spine from your neck downward, relieving your neck and upper back tensions. And doesn’t that feel great? Lunge also lengthens your torso. May release tensions through your pelvis. There may also be possible release along your spine through your lowest ribs and into your sacrum and/or tailbone. So, properly aligned and well supported, you could release your whole spine in this pose. Wow! When I say “properly aligned and well supported”, I mean that your belly stays on or over your thigh. If your belly slides off your thigh, you can overstretch the ligaments in your hip, destabilising your hip joint. Especially those with hyperflexibility (loose joints but a tight spine to hold it all together); a tendency to go to your extreme range and “hang” into your ligaments, overstretching that which is probably already overstretched. (Contemplate the fact there may be a mental/emotional pattern attached to that). In this pose, often LESS = MORE. Svaroopa(R) yoga teachers are trained to be meticulous about the pose angles and other body alignments. Blocks, blankets and props provide support to keep you safe and to create the most effective opening for your spine. Lunge relieves fear. It’s a great counterpose to other forward bending poses. In fact, it’s a great counterpose to life! When you open your spine, you open your mind.